Hanoi (VNA) – Deputy Prime Minister Vuong Dinh Hue has hailed the Kirin Holdings Co. Ltd’s investment expansion in Vietnam as a right decision since the country’s beer and beverage market boasts huge potential. He made the remarks at a reception for Keisuke Nishimura, Executive Vice President and Senior Executive Officer of the group, in Hanoi on August 17. The Vietnamese Government is sparing no effort to improve business environment and increase competitiveness as well as create the most favourable conditions for both domestic and foreign enterprises, he said. It is also stepping up the equitisation and divestment of State-owned enterprises, he said, adding that such major brands as Habeco, Sabeco and Vinamilk are under the equitisation plan from now to 2020. He hoped Kirin will expand investment in the field of beverages, especially those made from Vietnamese fresh fruits. The Vietnamese Government encourages non-alcoholic and non-carbonated drinks. 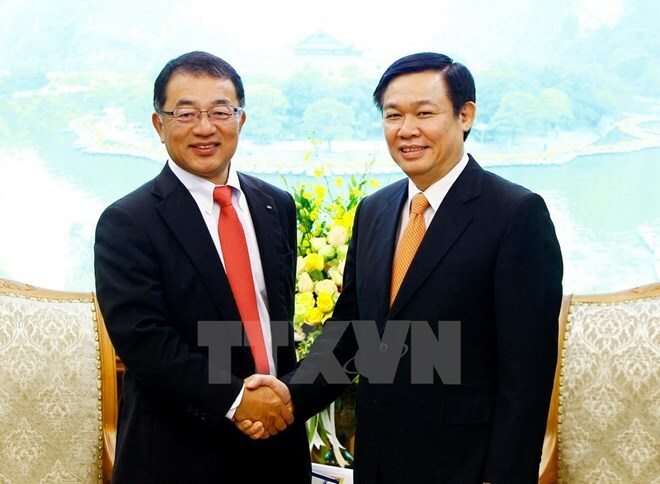 Keisuke described Vietnam is a large-scale market with strong development. As the Vietnamese Government is equitising State-run businesses, Kirin wants to make long-term strategic investment in Sabeco - Vietnam's leading beer producer, he said. He also hoped to cooperate with Sabeco in studying the development of fresh fruit juice in the future.